NICEE is an annual celebration of K-12 inventors and entrepreneurs from across the U.S. and is the marquee event of The STEMIE Coalition. NICEE is a live, in-person opportunity for youth inventors and entrepreneurs in grades 3-12 to display their critical thinking skills through inventing, innovating, and entrepreneurial activities. 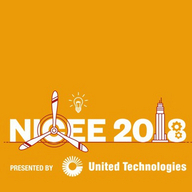 NICEE 2018 is presented by United Technologies Corporation and is hosted by the Henry Ford Museum of American Innovation.